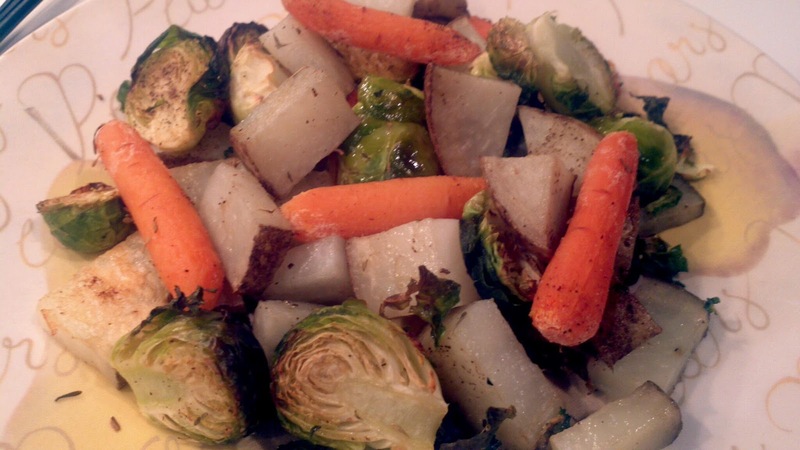 Fall is the perfect time to enjoy a hearty side dish of root vegetables with crisp brussels sprouts! This side is packed with vitamins A and C, and very high in potassium. When consuming fat soluble vitamins (A, D, E and K), it is recommended to consume a heart healthy monounsaturated fat alongside them to assist in vitamin absorption. The olive oil in this recipe provides that serving of dietary fat. You might require two roasting pans for this recipe (to avoid crowding the pan). I purchased the sprouts and carrots both in 340g bags, but you can adjust those amounts as needed. Preheat oven to 375 degrees F (for convection oven), or 400 degrees F (for regular ovens). Dice potatoes into small pieces (about 1cm tall, 0.5cm wide), leaving skins on, and place in a large mixing bowl. Chop stems off brussels sprouts and slice in half, and add to bowl. Add baby carrots and drizzle olive oil on top and toss to coat. Season with black pepper and thyme, and toss. Pour contents of mixing bowl into one or two roasting pans. Place in the oven and roast for 20 minutes. Remove from oven and use a spatula to flip pan contents. Place back in oven for another 15 minutes, or until potatoes are tender.